At a time when international tensions are running high, Serbia is trying to keep a balance between the EU and NATO on the one hand and Russia - on the other. An aspiring EU member, Serbia refuses to give up its historic ties with Moscow. And with the memories of NATO’s bombing of Serbia in 1999 still fresh, closer cooperation with the alliance is unpopular in the country. 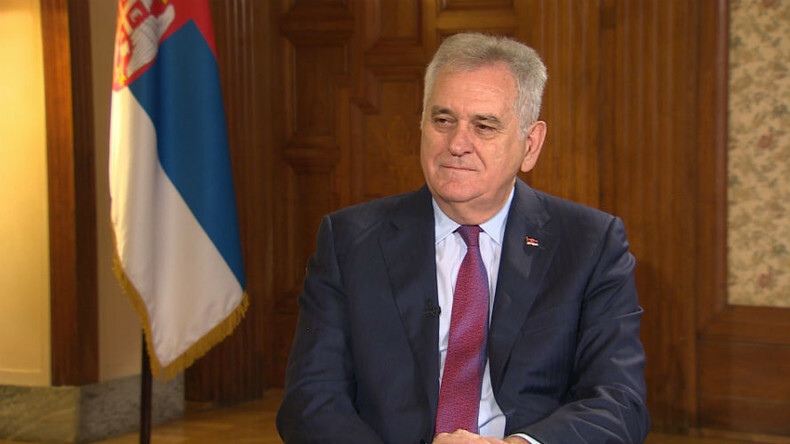 Will Serbia be able to maintain its neutrality? Or will it eventually be forced to choose between Russia and the West? The country's president - Tomislav Nikolic is on SophieCo to discuss all this. Sophie Shevardnadze: Mr. President, thank you for taking the time to come to our program. Welcome to St. Petersburg! My first question is about the war in Syria. The war has dragged on and the end is nowhere to be seen. But, among other things, this war has also affected Serbia. At this moment, thousands of refugees find themselves on the territory of Serbia. You once said that without Russia “Syria would have turned into a terrorist state, and that some powers would go so far as to recognize it as a sovereign state". Why, in your opinion, are Russia's actions in Syria so heavily criticised? Who could recognize such a terrorist state? Tomislav Nikolic: Every time Russia does something, you can always predict how each international stakeholder will react to it. And when they do, they never want to analyse Russia’s reasons for its actions. They always look for some hidden political agenda. In Serbia, we have always believed that Russia’s operation in Syria was intended to help that country defeat global terrorism, epitomized by ISIS. Personally, I believe the Russian operation has turned the tide in the global war on terror, as well as exposed certain nations’ and coalitions’ multi-year engagement in this war for the spectacle that it was. Assisting a legitimate government in Syria, Russia is also helping the world counter the threat of terrorism, which has instilled such fear in Western Europe. With all due respect to all international stakeholders, I believe Russia’s operation in Syria has been the only real campaign against terrorists. It should serve as an example for other nations, because it’s obvious they are in big trouble unless they crack down on terrorism now. What’s going on is not about whether the Syrian government will retain its power. Russia takes no part in the government’s war with the opposition – it is fighting terrorists alongside the Syrian government. Today the world is on the brink of a new Cold War, and Russia’s every step in any sphere – be it economy, defense or military operations – will be criticized by the opposing party. I don’t see any other reason why Russia is being criticized for engaging in the fight against terrorism. It’s time we sit down and take an unbiased look at where our world is moving. SS: Do you think the so-called Kosovo scenario could be repeated in Syria? There were some terrorist groups in Kosovo which were recognized as such by the West, but when later these groups came to power, the West recognized them as a legitimate government. Do you think the situation in Syria can develop along this scenario? TN: I spoke about it at the UN. The example of Kosovo shows us what can happen if somebody decides to recognize the Islamic State [as a legitimate state]. I could never imagine that the US would not only recognize Kosovo, but would also directly pressurize many countries into recognizing Kosovo and Metohija. Although at the beginning the groups fighting against the government of Yugoslavia were considered as terrorist groups and Yugoslavia was allowed to use any means in the fight against terrorism. In the case of Kosovo the West simply used correspondents of major Western networks to disseminate the stereotype of evil Serbs threatening Albanians who were deprived of their democratic rights. They also kept saying that Slobodan Milosevic is a dictator and that they have the right to fight against this dictatorship using any means. Today the Islamic State which kills children and people in the streets, in theaters, in cinemas, can hardly be portrayed as heroes who are under serious threat and who should have their own state. Ten years of NATO’s inactive fight against ISIL didn’t bring any results. They don’t seem to be striving to destroy the core of this organization. Certain terrorist leaders get killed, but after a short time of mourning they bring in a new leader, so you are faced with a new problem. As long as there’s even a single member of this group, he could be a leader. Fortunately, Russia decided to engage in the global war on terror, though ISIL is not a big threat to Russia so far. But Russia understands that ISIL may eventually reach the borders of the Russian Federation. I don’t think this threat is imminent today, unless, of course, some people in the West decide again to finance and support the so-called Islamic State. SS: Do you think NATO’s direct military intervention in Syria is possible like it happened in Yugoslavia? TN: No, it isn’t, because Syria has better air defence systems than Yugoslavia had, so NATO would be afraid to lose their aircrafts. SS: The migrant route into Europe goes through Serbia. How can Serbia deal with this difficult situation? What kind of help do you expect from the EU? TN: For now, Serbia has enough resources, patience and understanding to take in all the migrants coming to our country. From the very beginning we realised that Serbia is just a transit route for them. It was the EU that established this route through Macedonia and Serbia, which are not members of the European Union. The EU could easily change the route so that it would go from Greece and Bulgaria through the EU countries and into the five northern European states which are the final destination for refugees. As long as the EU borders are open, Serbia will continue to take in migrants fulfilling its humanitarian duty by taking care of them, especially children, by providing them with medical care and helping them to survive this coming winter and provide them with transportation so that they could move further. We register them so that we know who entered our country and who left it. But the EU is not coping with this problem. Serbia would like to have open borders, but it would be strange if Austria, Germany and other countries would stop taking in migrants, while they continue pouring into Serbia. What are we going to do if we have 20 or 30 thousand migrants living in Serbia for a year or two? I think even our traditionally hospitable people who are treating migrants like their guests today, wouldn’t be able to stand it. SS: Hungary hasn’t received the necessary assistance from the EU, so it started building walls along its borders. Luxembourg’s Foreign Minister responded to that by saying that Hungary should be kicked out of the EU. If I’m not mistaken, you are planning to tighten immigration control efforts. But if your country becomes an EU member, you wouldn’t be able to carry out an independent immigration policy. You realize that, don’t you? TN: Are we expecting any assistance from the EU? We simply want the EU to inform us of their plans when they eventually come up with any. It’s clear that the EU members don’t have a common policy regarding issues like migration or recognition of Kosovo and Metohija or many other issues. We don’t need any assistance – we simply need to know how much longer they are going to take in migrants and when they are going to stop taking them in, so that we would also stop taking them in. We are not going to put up walls and fences. The border between Serbia and Hungary runs through the valley, so we could easily put up a fence there. Fences will make people feel like they are at a concentration camp. I think that this is exactly how policemen would feel looking at people behind the fence – like they are guards at a concentration camp. But you asked the question that I expected – about common policies of the EU countries. We are in serious talks with the European Union and we comply with all the conditions stipulated in the 34 chapters of the EU negotiating platform. There are many guidelines there that we would be happy to implement in Serbia. But we also have serious disagreements with some statements. What does it mean? When you become an EU member it means that somebody else will determine your foreign policy. We cannot allow that because we are one of very few candidates with strong and independent foreign policy. Some other countries may feel comfortable with these limitations because they have always dealt with them. But Serbia has always been a free country, it has never belonged to the East or the West, but has always maintained friendly relations with the East and the West. And we want to keep them. Nobody can tell us what to do and we cannot jeopardize the future of our children and our citizens if the EU decides to declare war on some non-EU country at some point, for example. Serbia doesn’t need that. We have had our share of wars. Whenever there was a war we took up arms and fought for justice – always on the right side. And our sacrifices were never appreciated enough. On the other hand, what does this common policy mean? If the EU decides that Kosovo and Metohija are a state will Serbia recognize that as an EU member? That will never happen. Not even for the price of EU membership. SS: You aim to join the EU, but you say that you’ll never recognize the self-proclaimed Republic of Kosovo. So is there a way out of this impasse? Would it be enough if the northern Serbian enclaves became part of Serbia again? TN: If it were that easy, the EU would have just told us that this is how they see it, but there are five EU members that don’t recognize the independence of Kosovo and Metohija. We are friends with many of the EU countries, but it’s not because of our great friendship that these five states refused to recognize Kosovo and Metohija. They know that they might face the same problem, and recognizing Kosovo would rob them of the grounds to fight for their sovereignty and territorial integrity. Serbia, especially since 2012, will never again agree to Albanians acting as local authorities or law enforcement in the north of Kosovo and Metohija. There are some Serbian enclaves there, but they hold no sway over the officials that came from Pristina. We launched substantive negotiations with the Albanians, hoping that we could ensure a better life for all the people living in Kosovo and Metohija and agree on what was to be done in the future. But the Albanians were clearly seeking independence, and the EU clearly intended to help them, so we failed to reach an agreement. Now the UN is our only shield, our only protection. The Security Council is the UN body that would never endorse the idea of an independent Kosovo and Metohija. Currently we’re at the lowest point in our relations, because the Pristina authorities are trying to seize our property in Kosovo and Metohija. We could reach an agreement on this, or it could end very badly – we’re prepared for any development. So we have a huge problem with Kosovo and Metohija, and it affects our relations with the EU. The EU knows we’re never going to recognize Kosovo as an independent state. No EU official has ever said that we would have to, but the European Parliament, which also has a say in our EU membership, keeps saying that they’ll never let us join until we adopt some kind of legally binding bilateral agreement with Kosovo and Metohija. I assume that means delimitation and friendly neighborly relations. SS: I was just going to ask you about the EU members that oppose Serbia joining the EU. Now you have Croatia protesting very vocally. I know that the relations between the two countries have been strained since the war. How likely is it that Croatia as an EU member state could prevent you from joining the EU? TN: You know, if we reach an agreement with the key EU members, not one of the small countries would be able to stop our integration process or go against the EU. Croatia is a country we want to have friendly neighborly relations with. The situation was terrible. Croatian authorities have never treated Serbs well. Serbs left Croatia en masse, because they simply can’t live there anymore. I’ll tell you a joke that I heard just a few days ago. There is a Serbian enclave by the sea, where the Republic of Serbian Krajina used to be. So, a Croatian man has a house there, and his neighbors are all Serbs, and they have no electricity in their homes – they never will, because that’s the Croatian authorities’ policy, even though the necessary infrastructure and power lines are all in place. So this Croatian goes to the authorities and asks when he’s going to have electricity in his house, and they answer, “Never – you live in the wrong neighborhood.” His neighbors were Serbs, you remember. The Croatians had a plan, you see, to make the Serbs’ lives miserable there, so the Serbs started leaving. Not many will stay. We don’t know what their problem is with us right now. A large part of the Croatian territory was populated by the Serbs, but they left, and it’s all empty now. Croatia has no one settling there. We want to have good relations. We have no reason to quarrel with Croatia. Why would we do that? They can’t prevent us from becoming an EU member state. A conflict can only be used for the purposes of domestic politics. They had elections, so the politicians had to make it look like they’re protecting Croatia from Serbia. Serbia will never have another war with Croatia, because fighting Croatia means fighting NATO. NATO is stronger than us, and we don’t want to put the lives of our people at risk to fight Croatia. If Croatia behaves reasonably, we will have good relations, and if not, we will have chilly relations. But conflict and war don’t even cross our mind anymore. SS: Mr. President, you once said that Serbia can’t remain surrounded by the EU members and not join. I just want to understand – why do you want to join the EU so much? Switzerland, for example, is not part of the EU and it’s doing just fine. We saw Britain vote to leave the EU, followed by voices in France, the Netherlands, Sweden and Hungary advocating the same. So why is everyone leaving the EU, but you want so badly to join? TN: This opinion is a bit one-sided, I would call it Russia’s point of view. Not everyone is leaving the EU. If we had ten Swiss banks, we wouldn’t join the EU. If we had oil, like Norway, we wouldn’t join the EU. Or if we had industry like they do in Sweden, we wouldn’t join the EU. But we are undoubtedly surrounded by the EU members. And look, our best opportunity was the South Stream pipeline, but the project was abandoned because there is Bulgaria, who is an EU member, between us and Russia. So we are completely cut off. We don’t have any borders with Russia, so we could just say that we have our friends, markets, commodities, cooperation and so on right here. We are a country that the EU has invested in quite a bit. Some smart Europeans realised that Serbia has factories that can enter the Russian market without any restrictions or customs duties. There are certain advantages to not being an EU member and having close ties with Russia. Now the EU is deliberating whether to let us join or not. Why would we say we don’t want to join the EU? It’s the EU who has to decide whether it wants to see us as its member or not. We only insist we don’t want to join NATO, and no one is ever going to convince us otherwise. SS: Let’s talk about Russia. How are you going to maintain a good relationship with Russia? How are you going to avoid joining sanctions? TN: Listen, I know that some countries can’t take Russia’s embargo for more than six months. I’m absolutely certain about that. There will be a major rebellion in the EU over sanctions. Turkey is a large country; it’s bigger than some of Europe’s leading countries, but it still couldn’t afford to quarrel with Russia and had to seek reconciliation. Of course, it was Turkey’s own fault, and Turkey had to apologize and make a lot of concessions. It had to punish itself in order to make peace with Russia. SS: You’re saying you won’t become a NATO member, but you’ve just signed a treaty with NATO, despite your neutral status. You grant rather broad rights to NATO representatives on Serbian territory, access to government and private facilities, diplomatic immunity, freedom of movement. At the same time, you have a tight defence relationship with Russia - Russia sells weapons to Serbia, there are trade and defence contracts, etc. - how do you manage to balance between those two centres of power? Sooner or later you’ll have to choose. TN: We do have treaties with NATO. As I’m sure you know, there is a NATO contingent in Kosovo and Metohija. Regardless of the status of our relations with NATO, this contingent is the only protection for Serbs living in Kosovo and Metohija. As for arms deliveries, that’s not exactly the case. Russia does not supply Serbia with weapons for free. It’s just that when Serbia wants to buy something, we usually go to Russian manufacturers, because we have been using the same standards for our weapon systems as Russia for decades. So, we’re not looking for a free ride. We are ready to pay for it. We want to be partners with Russia in manufacturing and investment. This will be good for us and for Russia’s influence in Europe. Russia has a lot of friends in Europe, but Serbia is your biggest friend, and it will always be like that. Our forefathers have built a special kind of relationship that between Serbia and Russia, and we should preserve it. Russia is large, Serbia is small, but nobody in our countries should ruin this relationship. People who want to ruin it should be disqualified from politics. We also have an excellent relationship with China, and China never complains that we are friends with Russia. Why then is the West upset that we have a good relationship with Russia? But, like I said earlier, no matter what Russia does, its actions are always misrepresented. People always look for an ulterior motive to criticize everything Russians do. Serbia has always been Russia’s friend and will never do anything hostile. There is no way we can harm Russia. If Serbia were to impose sanctions on Russia, it would take 500 years for Russia to feel the effect of Serbia’s sanctions. Where would this get us? We would just lose our face and ruin our relationship with you. SS: Russia’s relations with NATO are very tense - NATO is upping its military presence on Russian borders, Western leaders are refusing to talk to Moscow. Now Serbia has always been able to maintain a balance in its relations with the West and its relations with Russia, but recently we’ve seen an example where this kind of strategy didn’t work out so well - I’m talking about Ukraine. It wanted good relations with the EU, with Russia, with the US and we see where that lead to. The Balkans are a region where the interests of great powers have historically colluded. I think that today you are finding yourself in a situation like that - maybe you want to maintain friendly relations with all your partners, you can’t picture it any other way. But do you have a feeling you’re caught in the middle of a crossfire? You started the interview by saying that we’re on the brink of a Cold War - do you feel like you’re right in the middle of this conflict? TN: I think what makes us unique is that we don’t pick sides. Our hearts, our minds, our love, our history, our faith, our language – all of that is with Russia. Nobody can question that. Serbia is a country with a population of 8 million people, surrounded by the EU. Historically, most of our neighbors never wished us well. In such a situation, you have to choose your path wisely. As far as Ukraine is concerned, I think what happened there was a great tragedy. It’s a tragedy that some countries didn’t learn from Serbia. A war against your own people will never get you anywhere, regardless of who started this war and who supported whom. Every opposition group which ho has the support of a major Western power invariably starts a civil war in their country. Will their country benefit from this war? No. Certain politicians may come to power as a result of this war, but the country as a whole will never benefit from it. So, I’m very sad when I think about Ukraine. It reminds me of what happened to Yugoslavia. Both Russians and Serbs made the same mistake: we built our countries with ethnic republics, and we thought these countries will be there forever. If Serbs only knew after World War I and World War II that their country will collapse, they would have built up Serbia first, and then other territories would have joined it if they wanted to. But then Serbia wouldn’t have been limited to its current borders; it would have included all the territories where Serbs lived, because we won the war. We gave everybody a chance. Do you think we would’ve agreed to make Kosovo and Metohija an autonomy if we knew that Yugoslavia was going to fall apart? Do you think Russia would’ve given up Crimea if you knew the Soviet Union was going to collapse? Those were our historic mistakes. So, as much as possible, we want to be a little island in the middle of Europe, a little country which wants to be friends with everybody for the benefit of our people. If it proves impossible, I think Serbia will be tragically divided into two parts, a pro-Eastern one and a pro-Western one, and God knows what will remain of it after that. SS: Mr. President, you, like a real diplomat, you evade a direct answer craftily. I’ll try to rephrase. You, like an involved observer, who understands how it works on both sides. I’m not a fatalist, I don’t like conspiracy theories, but people who are much smarter than me say that the chance of a direct confrontation between Russia and the West is growing. What do you think - is there a chance of war? And what position will Serbia find itself in if it starts? TN: I think war is impossible. There would be no winner in this war. Who knows what weapons would be used? Who knows how many people would be killed every day? How many houses would be destroyed every day? Who wants that? If I were the president of the world’s most powerful country, if I had the most powerful weapon, I wouldn’t want such a war, because when you are responsible for other people’s lives, I have to be much more careful than a regular person. A regular person can take a weapon and go to war but the head of a state has to think differently. I pray this never happens, because if such a scenario were possible, there would’ve been many wars between the West and the East in Europe since 1945. Yet common sense always prevailed. There were tensions and spies but at least there was no shooting. Today, when there are weapons capable of destroying a whole country in one day, hardly anybody can tell you what they would do if a war breaks out. If there is war, Serbia will disappear. Don’t ask me which side we’ll be on, because we’ll be crushed in any case. Like they say, when two elephants fight it’s the grass that suffers. We are completely innocent, and we will suffer in this big conflict. Don’t think that whoever forces the opposite side to surrender will feel great looking at millions of dead bodies. I fought in a war. I don’t shun war. But that’s exactly the reason why I can talk about it this way. You won’t be happy when you see your enemy dead. SS: Mr. President, thank you for this interview. The best of luck to you with everything you do for the well-being of your people. Thank you very much.